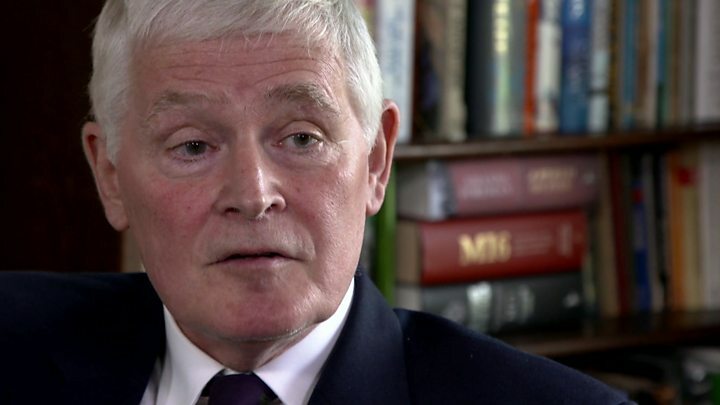 John Bercow's former private secretary has told Newsnight that he was bullied by the Speaker. Angus Sinclair said he faced angry outbursts, undermining, obscene language, and mimicry from Mr Bercow, who also smashed a phone on his desk. Mr Sinclair said he was paid £86,250 in 2010 as part of a deal that required him to sign a non-disclosure agreement. Mr Bercow denies bullying - with a spokesman saying "there was no substance to any of the allegations". Mr Sinclair, who has breached the terms of the non-disclosure agreement by speaking to Newsnight, said: "I thought to myself, it's in the public interest to know why I left. "Yes, it breaks that non-disclosure agreement, but it's the truth. There was bullying." Mr Sinclair, who spent 30 years in the Royal Navy, joined the House of Commons in 2005 as the private secretary to Michael Martin, who was then Speaker. In 2009, after the expenses scandal, Mr Martin was replaced by Mr Bercow, who Mr Sinclair says bullied him - shouting at him, undermining him in front of other staff, swearing, and attempting to physically intimidate him. After around a year of working for Mr Bercow, Mr Sinclair was given a "compulsory early retirement" by Commons authorities. The £86,250 lump sum - more than a year's pay - was part of a deal that required him not to make a complaint about his treatment at the House, or speak publicly about the manner of his treatment. This is not conventional for people retiring from the House. Others involved in the process have confirmed to Newsnight that the intention of the non-disclosure agreement was to prevent the issue of bullying being raised. "What I'd done was sign a cover-up and in a cynical way. I'd been paid to do it, and that's not a good feeling." A spokesman for the Speaker's Office said: "Mr Speaker strenuously denies that there is any substance to any of these allegations. "Mr Speaker has a superb team of dedicated, effective and long-serving staff - five of whom have worked for him very happily for a combined total of over 40 years." Conservative MP Andrew Bridgen, who is a long-standing critic of Mr Bercow, said the Speaker should "consider his position". He told BBC Radio 4's Today programme: "I think, at a time when we are looking for culture change in the House of Commons with regard to bullying and harassment, I think that's very difficult if the titular head of that organisation is mired in these allegations." But Labour peer Lord Hain said the "attack" on the Speaker was motivated by those "resisting his essential parliamentary reforms". Labour MP Barry Sheerman also defended Mr Bercow, saying he had been the "best reforming Speaker for 100 years", and it was only a "small group" of parliamentary officials "hated" his modernising efforts. Cabinet Office minister David Liddington said: "I have heard the allegations that have been made. Obviously any allegation of this nature is serious. It is a matter for the House of Commons to decide what to do." Newsnight has previously reported that House of Commons managers were informed in 2011 that Kate Emms, Mr Sinclair's successor in that role, had been diagnosed with post-traumatic stress disorder after less than a year working for Mr Bercow. The Speaker has categorically denied bullying Ms Emms. Reflecting on what happened, Mr Sinclair said: "I think if I'd actually said to myself I'm not signing this non-disclosure agreement, or I'd put in a complaint, or I'd done what anyone should do if they've suffered a bullying incident - to speak out and get it resolved, then [Ms Emms] might not have been put in that position." As a consequence of Newsnight's reporting on the culture of Westminster, the House of Commons Commission has commissioned an inquiry into the treatment of the apolitical staff who run the House. However, the investigation - led by Dame Laura Cox - will not investigate individual cases or reopen past complaints. Mr Sinclair said he had a good relationship with Mr Martin, but struggled to build a working relationship with his successor, Mr Bercow. Mr Sinclair told Newsnight: "The Speaker responded in a way that I can only say is a form of bullying. And that is to show anger, to thump the table to say that someone has failed in front of others... it seemed to get more frequent." Newsnight has spoken to other members of House staff, who have corroborated this account. Other officials have described Mr Sinclair being undermined in meetings and held responsible for things that were beyond his power. Mr Sinclair has also shown Newsnight entries from his contemporaneous diary, which records examples of these behaviours. Mr Sinclair told Newsnight that the Speaker was prone to "over-the-top anger. I'm not sure he was completely in control of it. The arms would wave around". "There was a tirade of how I'd let him down and it was the worst thing... there was a lot of bad language and suddenly his mobile phone which he'd been holding was flung on the desk in front of me and broke into a lot of bits." Image caption Mr Bercow in the chamber. His current private secretary is at the Speaker's left hand side. "I think we all know that every job in the land has to have some dignity. Well, I felt at the time that the dignity had been removed. "You would walk to work with a heavy heart. The horizon suddenly was low, and it was not a good feeling, it was a feeling of failure." The role of Speaker's secretary is unusual, in that it is appointed solely at the discretion of the Speaker. It is set out in Erskine May, the parliamentary practice guide, that the Speaker of the House has the sole power to appoint his own staff. While Mr Sinclair raised his treatment with House of Commons managers, any complaint would - in the end - have to be dealt with by the Speaker. In 2010, shortly after the general election, Mr Bercow was re-elected as Speaker. Mr Sinclair said he was called in to see the Speaker, who told him he was going to "redesign the office", and that Mr Sinclair would not be needed. His severance package included a payment of £86,250. But a letter from the Director General of Resources made clear the payment was explicitly dependent on signing a non-disclosure agreement that would bar him from speaking to the media - or raising a tribunal complaint. The House of Commons agreed at that time that there was no concern about Mr Sinclair's capacity. The House gave him a reference stating that he "acted with a very high degree of professionalism. He showed discretion, loyalty, assiduity and efficiency... there were no disciplinary issues affecting him".